Mr. Snore checks into the Sharemore Hotel, and the bellhop shows him to room 104. When he gets ready to go to sleep, he hears a squeaking mouse on his pillow. Mr. Snore calls downstairs to complain, and the bellhop explains that the mouse has had a very long day. Mr. Snore demands a new room, and the bellhop shows him to a room on the second floor. He goes to sleep but feels a rush of cold air. A hog is hogging the covers. Mr. Snore calls downstairs to demand a new room, and you can see where this is going. The third floor has a leak from the sea creatures on the fourth floor. The fifth floor has too many spiders. The sixth floor has bees, the seventh floor is too hot, the eighth floor is too cold. The ninth floor has giraffes, and the tenth floor has hamsters. The eleventh floor has the rest of the giraffes, and the twelfth floor has no one! Mr. Snore lies down to sleep and begins snoring. There is stomping, gurgling, and swishing above him, so he goes up to the thirteenth floor, even though the bellhop warned him not to. Mr. Snore climbs into a giant bed and falls asleep. And begins to snore. At the end, someone calls down to the bellhop. In a nice twist that will delight children, it’s a dinosaur calling to complain about all the snoring. The art is as fun as the story. The hotel is wedged between two other buildings, and we see Mr. Snore getting out a taxi with his violin case. He is dressed in a tuxedo, so maybe he has just played in the symphony. The bellhop is a tall red-haired fellow in a green and orange uniform. The phones are old-fashioned with cords. The bellhop has many friends at the front desk with him, a bird and a mouse in the fruit bowl. Mr. Snore changes into his red striped pajamas and white bunny slippers. The spiders have smiley faces, and giraffes stick their heads through holes in the ceiling. Pelicans rest on the backs of wing chairs. Hamsters have tubes to run through as they weave around the giraffes’ long necks. Hamsters go to different rooms in the tube structure to dine, sleep, play ping pong, and even swim. On one page Mr. Snore sleeps on the floor clutching his violin case with his suitcase as a pillow. The dinosaur has just come out of the shower with a towel over one shoulder and a toothbrush in his claw. On the last page, the dinosaur is seen sleeping in the lobby wearing his own bunny slippers and heart pj’s while the bellhop nods off with a mouse on his head. A penguin sleeps on the stairs. 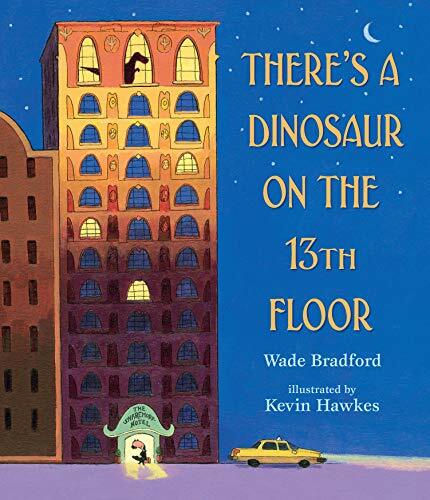 A clever twist with Mr. Snore as Goldilocks looking for the most comfortable bed, and a hotel figuring in as a character, There’s a Dinosaur on the Thirteenth Floor will be a hit with young and old alike. For dinosaur lovers, there’s only two pages of your favorite creature, but it’s worth the wait as you climb the hotel stairs to hilarity and finally a good night’s sleep.